OPUS 1 is fast, fun, easy to learn and is by far the best way to teach and learn music. It is not METHOD OR ROTE TAUGHT (memorizing without understanding). You do learn a few rules: The scale, chords, pedal, and improvisation rules. We study 15 major and minor keys, not the usual 12. You write in work books, play a computer game, and other fun things. You write in the math (rhythm), and chord block pieces. OPUS 1 develops both the left, analytical and the right, artistic sides of the brain. Method teaching only develops the right side. OPUS 1 is also known as the WRITE TO READ SYSTEM. It is a joy to watch my students progress and grow in their abilities and love of music. 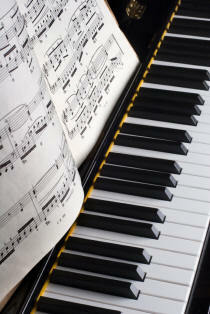 Piano lessons are customized to each student based on their skill level and individual needs. For new students, I offer a Free Initial Lesson coupon. I am sure you will be delighted with the quality of instruction you receive. Contact me to arrange your first lesson!